Thanks Judy. Those little marigolds pack a punch. Very cute! I would have never thought of using marigolds in a vase. Thank you. I think they hold up pretty well when cut. Love the view from above, Susie, and interesting that you too have dithered a little for an appropriate vase. Perhaps it’s better not to have any preconceived ideas of what vase might use? Did you use anything to hold the stems in place, or did the large numbers used deem it unnnecessary? Thanks Cathy. They did ok with just packing the flowers together. It would have been better to use a frog or some rocks to hold up the stems of the marigolds, but I was in a hurry and by the time I realized it, I just kept pushing forward. I finally remembered a dish I could have used, but didn’t think of at the time. Maybe I’ll have to try this arrangement again sometime. Yes, it did look as if it worked just fine as it was. I occasionally wonder if it is worth keeping a photographic record of my vases so I can flip through and find what appears to be the most appropriate one more easily, but it’s never gone further than wondering…too little time, so many other things to do! Cathy, I’ve been meaning to do a post on this idea of a photographic record of Monday vases. I wanted to be able to look back at a glance at the vases so starting last year in 2015 I created a page for each year with a gallery of images. Has been very helpful. So much so I even went back and recreated 2014. Floral Design. Here are quick links if you’d like to see. 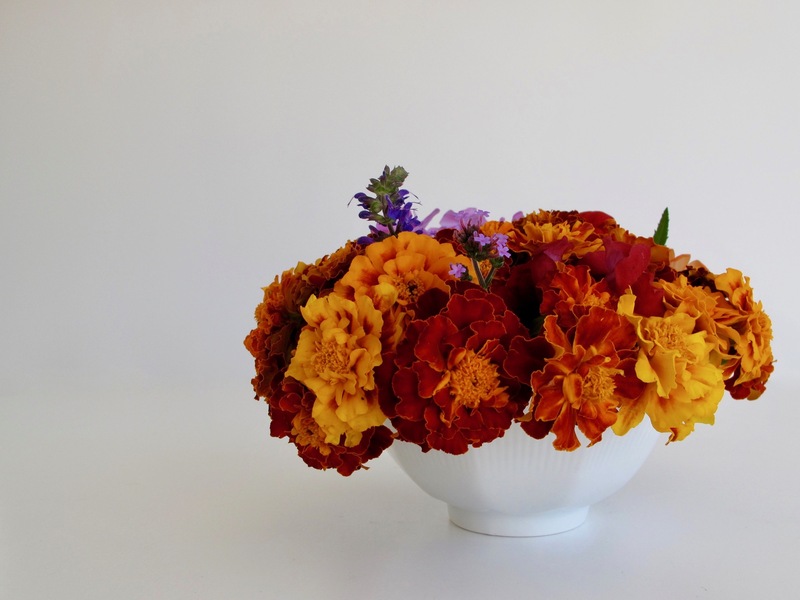 Nothing like marigolds for those intense fall colors. And massed together they make quite a statement. Linda, I’m so glad I planted marigolds this year. They have been great in the garden and now we’re really really enjoying them indoors. There’s a lovely range of warm colors in those marigolds. They make a wonderful salute to autumn! Thanks Kris, I was intrigued by the variations in pattern and color. 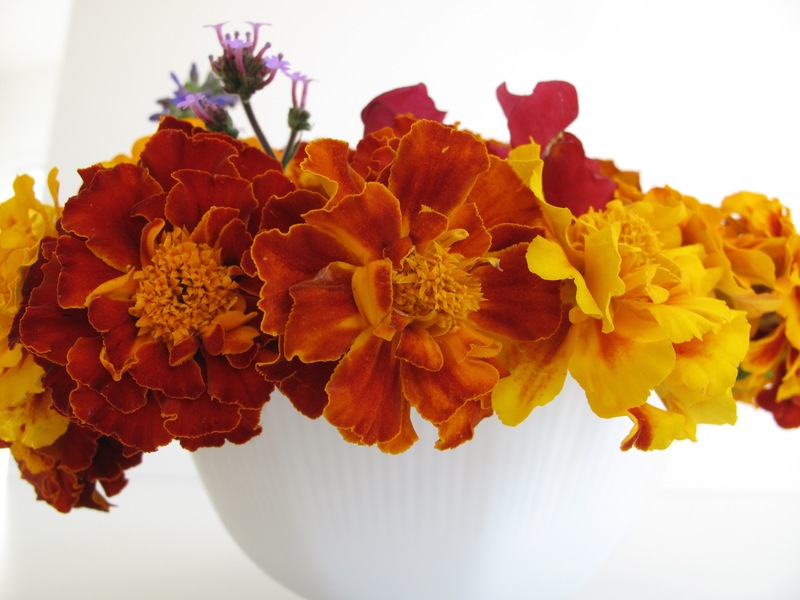 I love French marigolds, great bloomers and their pungency is bracing. Looking at your arrangement reminds me of a birds-eye-view flying over the autumn forest. Oh, that’s a good analogy Eliza. We don’t have much fall color here yet so I’ll pretend to be soaring overhead. Wow, those marigolds are like burning embers. A beautifully balanced arrangement as usual, Susie. Thanks so much. The marigolds do have some fantastic, rich colors. 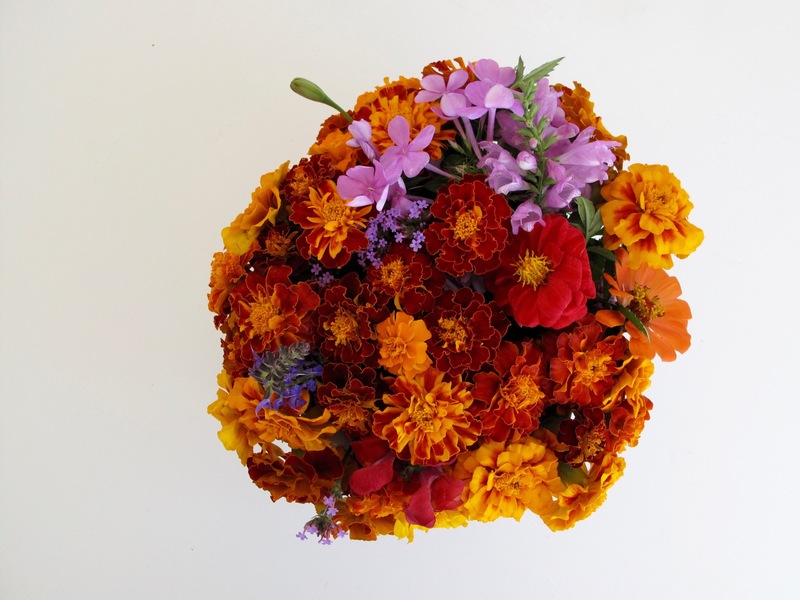 I’m loving the warm autumnal hues in your marigolds and the touches of lilac too. The little white bowl is perfect. Thanks Elizabeth. I think the color shift added by using the phlox and obedient plant and verbena did help keep the arrangement from being too monotonous. The mass of orange flowers creates such intense colour and warmth. I could almost imagine that bowl being warm to the touch! 😉 I love the little purple dots among the marigolds too. Those colours together are so effective. Thanks Cathy. We’re starting to get a little chilly here at night so perhaps that fiery bowl of marigolds will make a good hand warmer. That is so colorful, Susie. Makes me think it is fall already. Thanks John. Fall has taken its time this year, hasn’t it? Fine by me. I don’t really like cute usually, but that is so cute I love it! 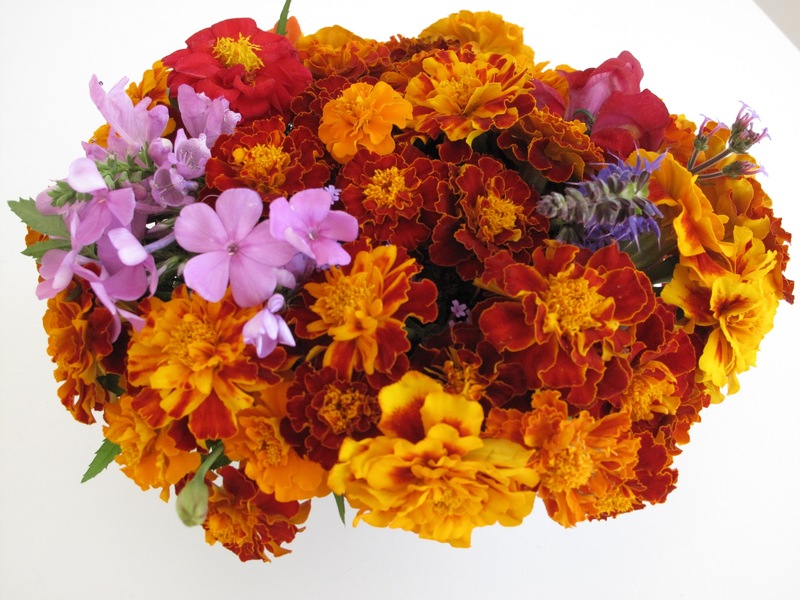 We always used Marigolds as late season annuals in Atlanta, used between Labor Day and frost or until pansies. Marigolds have always been a favorite but I don’t always get them planted. They have put on a good show for fall. Thank you Julie, so nice to hear from you. I admire your flower skills so I’m pleased you’ve found ideas in my little vase today. 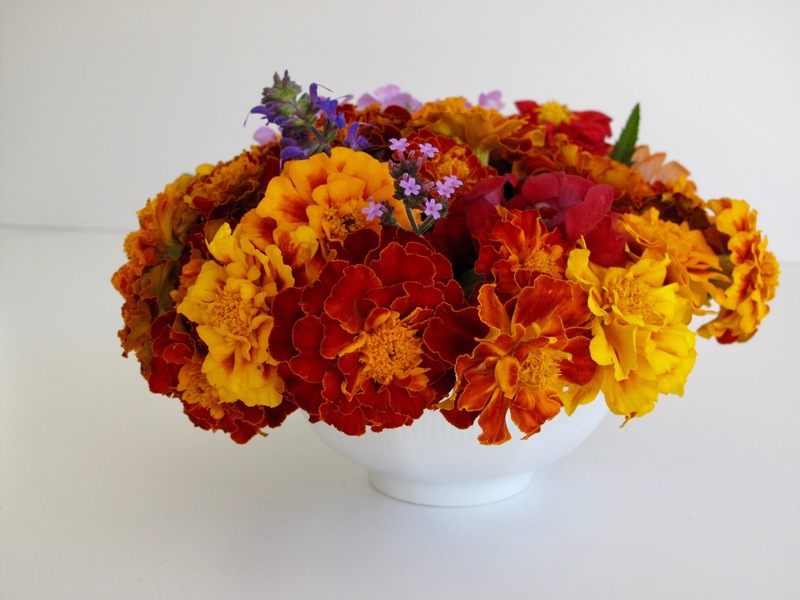 I’ve used marigolds in tiny vases before (well a shot glass or such) when I needed just little bit of color around. They keep well. Take care. Thanks Marian. BTW, Hope you and your family made it through Matthew ok. Was a mean storm. 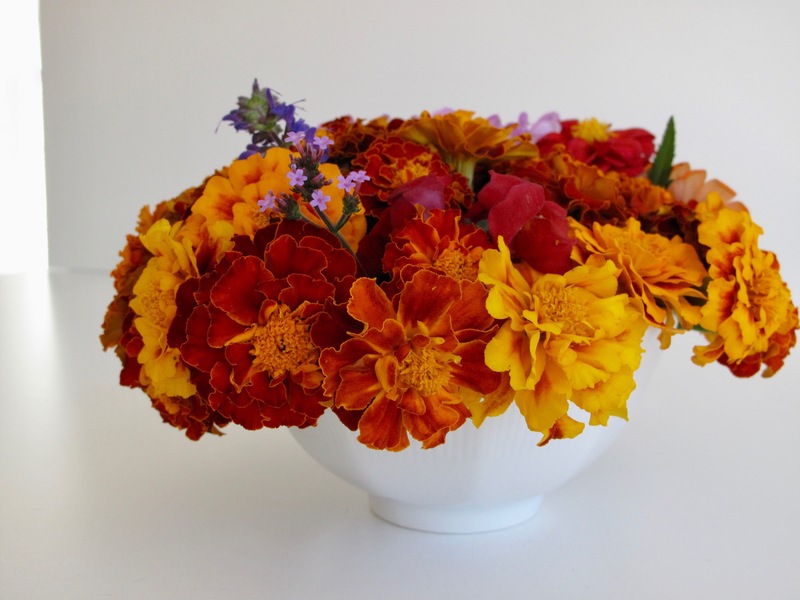 Lovely fiery tribute to autumn Susie; I always underestimate the beauty of marigolds, I shouldn’t because they have such an intensity of colours and the hues all work beautifully together. Thanks Christina. Although they’re commonly grown, I hadn’t had marigolds in a while and they have been great. While everything else is dying back, these still look fresh. Love the combination of marigolds and phlox. How unusual and cheerful. The marigold colours are perfect for autumn and are remarkably similar to the sycamore leaves falling round here. You have opened my eyes to the charms of marigolds. I know they’re old-fashioned but they blooms their little hearts out with little care. Long-lasting in a vase also.